"A twist on a recipe found on this site. Being from Louisiana where shrimp is plentiful and served often I really needed something new. Just found out how AWESOME and healthy asparagus is. Nice to have leftovers. 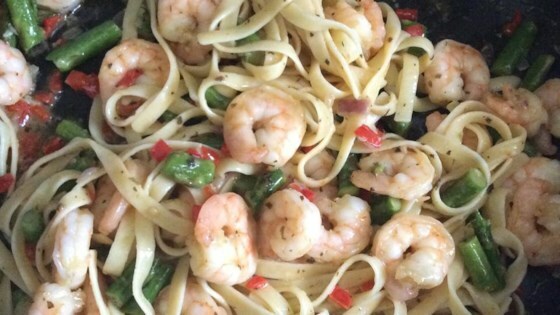 If you want more shrimp, add more; I find the veggies fill the space, making it healthier." Bring a large pot of lightly salted water to a boil. Cook spaghetti in the boiling water, stirring occasionally, until cooked through but firm to the bite, about 12 minutes; drain. Transfer to a large mixing bowl. Melt butter with olive oil in a large saucepan over medium-low heat. Cook and stir asparagus, red bell pepper, shallots, garlic, basil, red pepper flakes, and oregano in the butter mixture until the pepper is softened, about 5 minutes. Add shrimp and continue cooking until the shrimp are bright pink on the outside and the meat is no longer transparent in the center, 3 to 5 minutes more. Pour shrimp and vegetable mixture over the spaghetti and toss to mix. Sprinkle Parmesan cheese over the pasta mixture and season with salt and pepper. A flavorful, delicious, healthy dish! I’ll definitely be making this again! Made just as directed, only adding a bit of Cajun seasoning, as others suggested. We enjoyed it a lot and I will make it again. Thank you. Just added salt and pepper to the skillet, and a little pasta water when finished. We loved it! I have made this over and over. I would not Change a thing. Quick and easy. So tasty! I added a dash of Cajun seasoning, as one other person had suggested, but otherwise followed recipe exactly. I highly recommend this, and it will be a regular in our rotation for sure! This was great. I added a little more Parm because we are a cheese eating family.